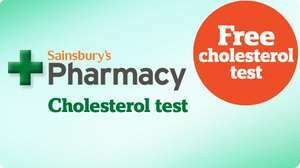 Sainsbury’s Pharmacies*, in collaboration with Flora pro.activ, are offering a free cholesterol test instore. Simply call into your local Sainsbury’s pharmacy to book your free test. The Sainsbury’s pharmacist will also be able to advise on how to manage your cholesterol effectively and how you can benefit from a healthier lifestyle. Free test ends 25 September 2012. *Selected stores only. Subject to availability. Your own GP is happy to do a cholesterol test. The results are far more indepth and accurate - telling you about your bad and good cholesterol. Best of all it is also free. Your own GP is happy to do a cholesterol test. The results are far more … Your own GP is happy to do a cholesterol test. The results are far more indepth and accurate - telling you about your bad and good cholesterol. Best of all it is also free. And, you have to book a time with your GP during work hours! I would rather my GP dealt with this, Flora have an agenda. Of course any kind of free test that makes people think about their health is better than nothing. My GP has surgeries outside of working hours so maybe my surgery is unusual. It's great offer when you have a visiting relative from abroad (like in my case) who has to pay to see a gp, where is they can just do a quick check there and then no questions asked! Tesco do a free Diabetes test if it has a pharmacy in the store.Plus for £10 you can get a blood test that tests for lots of things. Sorry cant remember what it was for but you do get the results back the same day. My husband and I had ours done at Sainsburys today. Popped in on the off chance and booked a slot for half an hour after we arrived. Very professionally done. Blood taken by counter staff in a private room and results discussed with pharmacist. Results are very similar to those I had done by the doctor last year. No one tried to sell me anything. Blood pressure and glucose also done at the same time, although glucose tests were inaccurate as we had just eaten.